ITIL® translated into easy to read, customizable Visio process templates in BPMN format. Process diagrams in four levels of detail describe the process activities and the information flows between the ITIL processes. The ITIL® Process Map for Microsoft Visio is an officially 'ITIL® licensed product'. 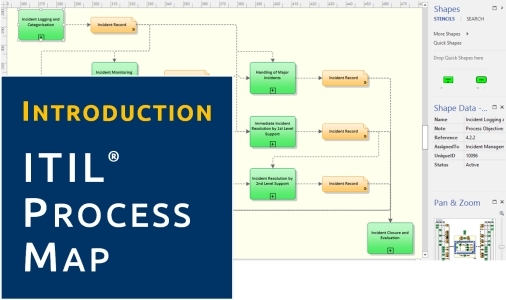 Watch a video with Stefan Kempter introducing the ITIL Process Map (11:04 min)! The ITIL top-level processes (service lifecycle stages) and their interrelationships on one single page. This is the main entry point into the Visio process model. A set of 5 Visio diagrams for each stage of the ITIL service lifecycle, illustrating the ITIL big picture. A set of 24 diagrams for the ITIL main processes (e.g. Change Management). These Visio diagrams show on one single page what an ITIL main process is about. From here, the user is able to open detailed BPMN process diagrams on the sub-process level using hyperlinks. A legend page explains the different types of shapes used in the Visio process model. The ITIL Process Map for Visio includes an Excel repository feature to manage certain types of objects which are used throughout the various process diagrams (Process, Data Object, Role, and Checklist shapes). The repository itself is a simple Excel file which is easy to modify. A special Visio add-in and a corresponding toolbar allow you to pick existing objects from the repository from within Visio. Check out our special page with more detailed information about the Excel repository feature! Additional documents help you to get started with ITIL and the ITIL Process Map for Visio. This document contains a brief introduction to ITIL and explains how the ITIL Process Map for Visio was created from the ITIL books. ITIL implementation projects are characterized by a typical course of action, independent of the size and type of the organisation. This made it feasible to devise a time-tested project blueprint which can serve as a guideline for a wide range of ITIL initiatives. Process owners use objective quality criteria to assess whether their processes are running "well". To support the selection of suitable KPIs, the ITIL Process Map for Visio contains a choice of suitable metrics for the most important ITIL processes. Product specification The product specification provides a detailed list of all components included in the ITIL Process Map for Microsoft Visio. Request a live web presentation.